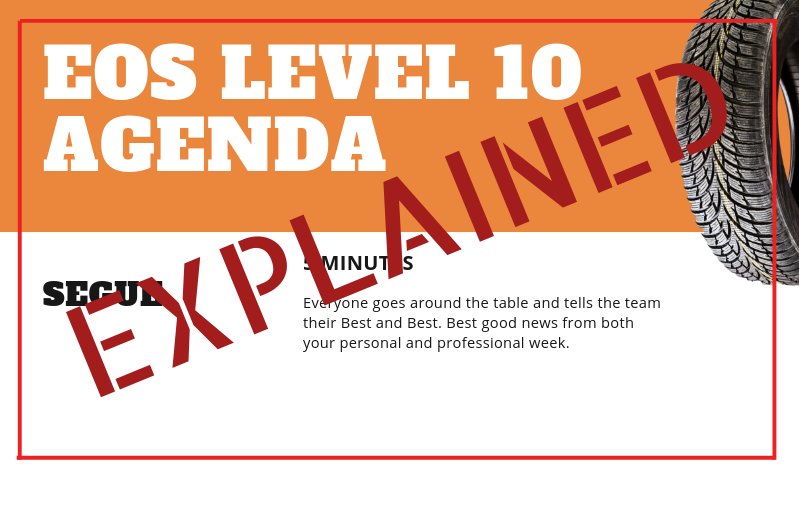 That’s why I’ve put together a quick 4-part guide on how to use the EOS Level 10 Meeting Agenda to full effect. I’m not going to lie to you. These articles alone aren’t going to be some magic pill that make the L10 Meetings go perfectly. But, take 5 minutes out of your day to read this, and you’ll be on the path to success. If you aren’t familiar with the Level 10 Meeting Agenda, this article may feel like a bit much. That’s OK. I’ve got some further reading linked at the bottom that will help you put this article in context. Whether you’re familiar with the L10 or not the agenda below should give you a quick refresher / introduction as well as a guide to actually using the L10 correctly. Description: Each member shares their best professional and personal news. 1 of each. Objective: Build trust. Build Community. The Segue and the Conclusion are the sections of the Level 10 Meeting that my clients tend to want to skip at first. A lot of teams start forming the habit to save time / make up for people being late or leaving early. Or sometimes, they just don’t think the Segue is valuable. Neither of these is a good excuse. First, if your team isn’t capable of dedicating 90 minutes a week to the betterment of the company, that’s a problem. Showing up on time and being ready to rock and roll the second the meeting starts is a critical aspect of the Level 10 Meeting. We’re not just starting good business practices, we’re forming good habits for efficiency as well. Beyond that, this 5 minute segue isn’t just killing time and saying “hi”. This is the time where a group of individuals maintains the relationships that makes them a team. Sharing the business best keeps people up to date, sure, but it also serves a greater purpose. This business best reminds the team members that every member is out there accomplishing big things every week. It gives you a good reason to respect your colleagues. The personal best then reminds you that this isn’t just the CFA, this is a mother, father, friend, whatever. This is a person who has a life beyond the walls of this company, one they are willing to share with you. That might sound irrelevant to building a better business. But if you can’t see the person as more than just a job title, how can you expect them to do the same for you? READ What Is The EOS Clarity Break? A Tool For Keeping Yourself Honest.